The standalone Oculus Quest is also out in spring for the same $400 price. After three years, Oculus is retiring the Rift headset and replacing it with the Rift S, redesigned with the same inside-out tracking technology it's using for the Oculus Quest. Both new headsets are coming out this spring for the same price of $400 and will be able to run many of the same games, but the Rift remains the higher-end system powered by a PC, with some new exclusives on the way. The Rift S has a new strap system reminiscent of the PSVR, and it's definitely easier and faster to slip on. A knob at the rear of the strap loosens and tightens it, while a simple velcro strip along the top helps hold the whole rig taut. 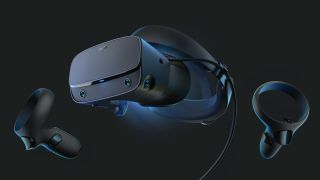 Oculus partnered with Lenovo, which has previously built a Windows Mixed Reality headset, to design and build the Rift S.
It's actually a slightly heavier headset than the original Rift, but the strap positions its weight differently. It doesn't rest on the ridge of your nose, and only takes a few seconds to put on and get situated. I tried the Rift S back-to-back with the all-in-one Oculus Quest, and the RIft S was noticeably lighter. The tracking and new displays are the big changes here. The Rift S uses a 2560x1440 display, aka 1280x1440 per eye, compared to the original Rift's 1080x1200 per eye. Even though I haven't worn a Rift in months, it was immediately obvious that this is a much clearer display. That's less to do with a few hundred more pixels and more to do with adjustments to the fresnel lenses. You'll see fewer distracting 'god rays' as a result of the lenses, and the screen door effect between pixels is still there but hard to spot. It's an impressive improvement considering the relatively minor jump in pixel density. A surprising change is that the display actually runs at 80Hz, instead of the previous Rift's 90Hz. In practice, I didn't notice any drawback from that lowered refresh rate, and I didn't notice any issues with the switch from the base station external tracking to the new inside-out tracking, which both the Quest and the Rift are using. Inside-out comes with some big advantages: no fussing with sensors, and being able to quickly draw a line on the floor during setup to define your playspace. The disadvantage, compared to other tracking systems like the Vive's, is that if the sensors in the headsets can't see your hands, they can't track the Touch controllers. But Oculus's predictive technology has gotten good enough that motions like reaching behind your back to grab a weapon, common in VR games, will still work smoothly. The Rift S has one extra sensor compared to the Quest to offer improved tracking. It'll take more playtesting to really nail down how it compares to the original Rift's external sensors, but Oculus's goal here is straightforward and practical: make VR as easy as possible to get into. The headset's easier to adjust. You now plug a single DisplayPort cable and a single USB cable into your PC. No messing with piles of USB and properly angling sensors and so on. Another nice feature is what Oculus calls Passthrough+, which is a high quality camera passthrough that you can enable while wearing the headset to see your surroundings. In this streamlining, the one feature I miss is the Rift's on-ear earphones. The sound quality was great, but with the Rift S and the Quest Oculus has opted for speakers built into the headstrap that offer less isolating sound. The idea is to make it a bit easier to get people into VR without them feeling totally cut off (and it simplifies manufacturing and probably helps cut costs). But the sound quality suffers. The Rift S now has a 3.5mm headphone jack for wearing your own headphones or earbuds, so the option for quality immersive sound is still there. It's just a shame it's no longer the default. Oculus hasn't given a date for the Rift S, but it's out this spring. It's compatible with all existing Rift games, and future development will be backwards compatible with the old hardware. So if you already have an Oculus Rift, you don't have to worry about future games only working on the S hardware.